Aquaman vol. 1 #42 © 1968 DC Comics. COVER ART BY NICK CARDY. The first recorded clash between DC Comics' Sea King and the enigmatic Black Manta occurred in Aquaman vol. 1 #35 (1967). In “Between Two Dooms!” by writer Bob Haney and artist Nick Cardy, the domed, undersea city of Atlantis is endangered by a terrorist clad in a black wetsuit and a silver breathing helmet with glowing visors that resemble fish eyes. This mysterious malefactor's true identity is unknown, but Aquaman intimates at least one previous encounter by identifying him as “my old enemy … Black Manta!” Commanding a school of aggressive mutant Manta-Men that project crackling stun blasts with each flap of their wings, Black Manta, piloting a laser-firing Manta-Ship, makes Atlantis uninhabitable for its water-breathing denizens and kidnaps the Sea King's son “Aquababy” to lure Aquaman into surrendering. As Black Manta draws bead on his nemesis, ready to harpoon him to death, the arrival of another Aqua-foe, the Ocean Master, distracts Manta, allowing Aquaman to save the day. A scant ten weeks later, after the June 29, 1967, on-sale date of Aquaman #35, Black Manta returned, courtesy of the same writer, Bob Haney, but in a different medium: animated television. The premiere Aquaman episode of Filmation's The Superman/Aquaman Hour of Adventure, “Menace of the Black Manta” (original airdate: September 9, 1967), featured the villain (in a slightly altered uniform of blue and purple), as well as his Manta-Ship and Manta-Men. Voiced by Ted Knight, also the cartoon's narrator (who later became famous as befuddled newsman Ted Baxter on The Mary Tyler Moore Show), Black Manta appeared in four additional TV episodes. Black Manta's near-contemporaneous comic and cartoon debuts suggest that Haney and the Aquaman comic's editor George Kashdan, who also wrote episodes of the TV series, may have co-created the villain for television but absorbed him into the sponge of comicbook continuity. Black Manta has since been a consistent foe in Aquaman's comic, often battling the Sea King with high-tech weapons. 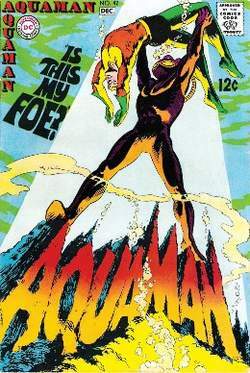 The depth of Black Manta's hatred of the Sea King was explored by writer David Michelinie and artist Jim Aparo in Adventure Comics #452 and Aquaman #57 (both 1977). Aquababy (by this point more commonly called “Arthur, Jr.,” Arthur Curry being Aquaman's real name) was once again in the evildoer's clutches, Manta forcing Aquaman and his sidekick Aqualad into a gladiator-style brawl to spare the child. Aquababy nonetheless perished, a tragedy that haunts the Sea King to this day. The other surprise of this two-part shocker was the disclosure of Black Manta's face: he was revealed to be black— a rarity for comics of the day—becoming DC Comics' second African-American supervillain (after Batman foe Black Spider, who premiered in 1976). Black Manta soon returned to television animation as one of the Legion of Doom in ABC's Challenge of the Super Friends (1978–1979), with Ted Cassidy (Lurch of The Addams Family) portraying the character. In subsequent years, Black Manta disappeared and reappeared with the ebb and flow of Aquaman's publication (the title has a long history of cancellations and revivals). A particularly brutal clash between the subsea adversaries transpired in an early 1990s revival, in which Manta nearly gored Aquaman to death. In 1995 Manta sold his soul to the demon Neron and was transmogrified into a gruesome manta-creature, temporarily hiding his affliction inside his classic costume. He briefly became a drug smuggler in the Kevin Smith–scripted Green Arrow vol. 3 #3–#4 (2001). In a 2003–2004 Aquaman story arc, Aquaman magnanimously used his mystical water-based Healing Hand (bestowed to him by the Lady of the Lake) to restore Black Manta's humanity; Manta returned Aquaman's kindness by continuing his war against the Sea King, resuming his sinister machinations in 2005 by undergoing water-breathing gene therapy in an effort to become an even greater threat. Black Manta's popularity in comics and on TV has translated to the collectibles shelves: in the 2000s, he has appeared as Hero Clix gaming miniatures, a Super Friends action figure, a DC Pocket Superheroes figure, and an Alex Ross–designed action figure. It fully outlines the game's six remaining DLC characters including Black Manta, Beast Boy and more. The game features 21 undersea levels, as Aquaman defends the deep-sea city of Atlantis against his most infamous arch-enemies Ocean Master, Black Manta and the Lava Lord of the Fire Trolls. Based on the heavily modified screenshot, the silhouettes of the characters are believed to be Beast Boy, Black Manta, Batwoman, Azrael, Raiden and Enchantress. Aquaman defends the deep-sea city of Atlantis against three of his most infamous arch-enemies, including the Lava Lord and Black Manta.